Effol White Star Spray Shampoo will make every grey and light horse beautifully clean again because it tackles even the most stubborn of dirty marks. The high quality formula also contains special additives which neutralise the yellow tint for a bright and clean coat. Contains extracts of chamomile blossom which help to strengthen the protective function of the skin, while panthenol makes the skin and coat smooth and shiny. Supplied in an easy to use spray bottle. Simply spray onto the damp coat, rub in, rinse with clear water and finally remove excess wetness using the Effol Orca Sweat Scraper. Shake well before use! Panthenol, extracts of chamomile, mild surfactants. 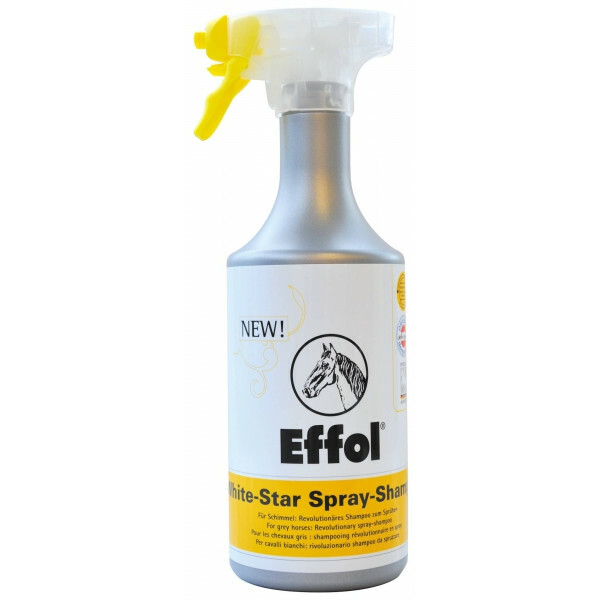 There are currently no questions for Effol White Star Spray Shampoo for Horses - be the first to ask one!